113436 visits since Jan. 2007. Tregastel is a small town of northern Brittany on the Westernmost part of France. 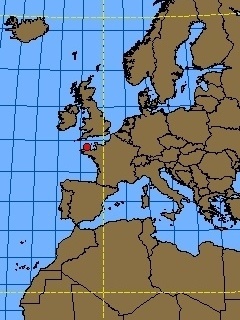 This location extend inland from Tregastel Bourg to the coastal Tregastel Plages. The colors of the sea and the rocks have made of this area a very popular and populated place. During our trip in late October 2006, the site was quiet and foggy. We enjoyed the views and the shell collecting. The coastline is very indented and pass through many creeks, islands and points. 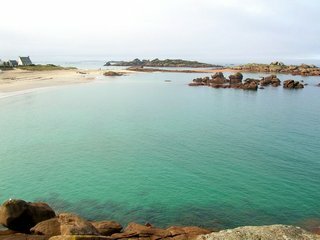 Because of this complex shoreline, the presence of many islands offshore and shallow waters, the sea remain rather calm and the water is very clear. 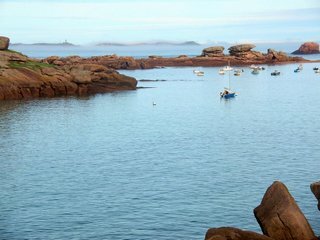 The granit is the dominating rock in Brittany, and around Tregastel this rock is amazing : It has been shaped by the wind, the sea and the rain into strange rounded forms. In addition, the granit's feldspath of this area has a purplish tint that turns everything into pink. 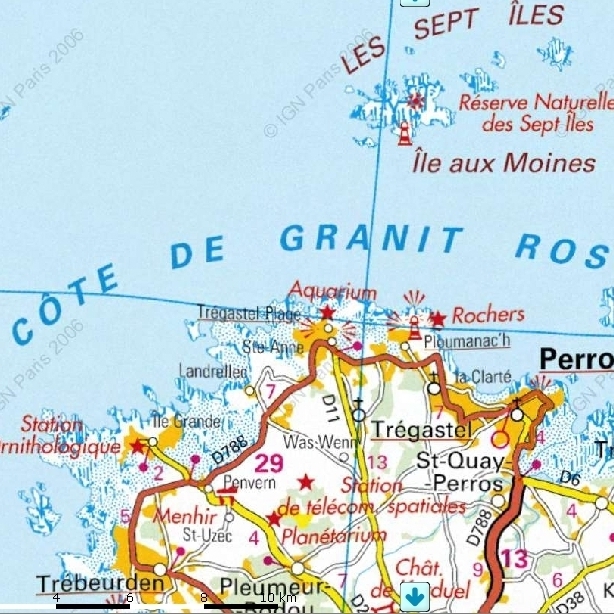 The French name of this region is "La Cote De Granit Rose" (The Pink Granit Coast) is not usurpated at all and the granit formations must be seen , especially when it's sunny after a shower. Then the purplish coloration of the rocks contrasts against the blues , the greens and the turquoises of the sky, the trees and the sea. 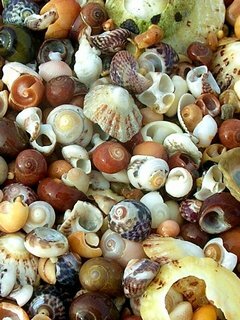 We walked along this beautiful coast in midday at low tide , and I was hesitating to look at the landscape or at the ground for shells. However, we could see live Patellidae and Trochidae on the rocks and especially nice Monodonta lineata	. A few stops on sand patches provided a good deal of dead gastropods shells mainly composed of Littorinidae and Trochidae. Amongst them a number of Littorina obtusata	with its exquisite color variations (yellow to orange to brown, green to black, etc. 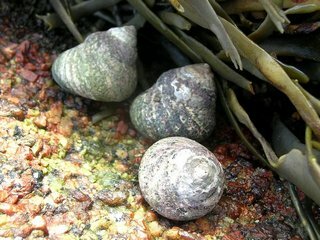 ), a few Littorina littorea which is a famous seafood here (sold as Bigorneaux) and some species of the genus Gibbula. Amongst the bivalve shells, Mytilus edulis and Cerastoderma edule were everywhere. There could be also found a few Veneridae I did not succeed in identifying except for a good specimen of Tapes decussatus	. A pink specimen of Tellina tenuis	was also collected here as a recall of the color of the surrounding boulders.